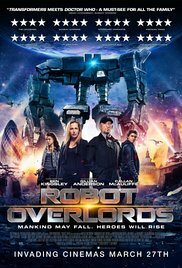 Alien robots come to Earth and assert their control over humanity. They claim that they only want to observe humanity. They enforce a strict no one allowed outside rule. They implant humans with a device that alerts sentries to anyone who goes outside and if they refuse to comply they are destroyed. They also employ humans to be their proctors. One of these men is Robin Smythe. He tries to get Kate Flynn to be his wife but she still mourns her husband whom Smythe says died. But her son Sean, doesn’t believe it. He sends messages out asking anyone who knows anything about his father to tell him. One day he and three young people are fooling around when they discover that they turned off their implant. That’s when they go outside and someone answers Sean’s message and tells him where his father is. I understand that this film was made for a young audience. Actually I should form an opinion with this in mind. Does that mean that films for a young audience always look terrible ? And must I, as an adult, always judge these movies from that perspective? Why ? “The Goonies“, “How to train a dragon“, “ET” and (I’m ashamed to say it) “Frozen” are clearly creative products meant for toddlers among us. If I were to write an opinion about these films, this would be a remarkable positive sounding opinion. Youth films can also be entertaining, with a subtle story and surprisingly good looking special effects. But just as “Big Game” this film fails on several levels and even sounding names like Gillian Anderson and Ben Kingsley can’t change that. First, there are the pitiful-looking special effects. This is due to the limited,available budget I guess. It doesn’t look like a new version of “Transformers“. It rather resembles an old episode of the “Power Rangers“. Admittedly, at times it wasn’t so bad, but most of the time it seemed as if a bunch of “Dinky Toys”-like robots were pasted onto the screen. Not to mention the mastermind that was connected to the whole army of robots. It looked like “Frank” from the eponymous film. This really made no sense at all. But especially the story is terribly childish, incoherent and predictable. The opening text is enormously brief. That made me already suspicious. We’re told that three years ago a swarm of robots invaded earth and there was a war that lasted 11 days. Since then (already 1264 days), the whole world gets grounded and everyone gets an implant in the neck so the robots can intervene immediately if someone leaves his house. The choice you have then is to get the hell out of there, rush to your home and get inside as soon as possible. Or get hit by a whopper of a laser beam and vaporize. Because that is the only rule the robots have introduced when taking over earth : “No one can leave his home“. This rule applies until the occupiers are ready with their (unknown and according to them innocent) research, after which they will disappear again. Then again, those robots aren’t exactly that superior, because they still use individuals, who are known as “collaborators”, who make sure everybody obeys and follows that rule. They can even intervene by briefly saying a command in an imperative way, followed by an authorization code. The in anger erupting robot immediately calms down and runs of to take care of other stuff. Instantly I asked myself some pressing questions. How did those house arrested earthlings get food and beverages ? I suppose the weak ones systematically disappear because there’s no medical care available? Electricity, water and other utilities will malfunction after a while ? How is it possible that the partying gang can still consume alcohol ? The way the implants can be switched off briefly, is so simplistic that it seems unlikely. And scientists and rational people are seemingly deported first, so that they couldn’t come up with this solution. And apparently Mr. Smythe (Ben Kingsley) still doesn’t know how the brainwashing machine works, otherwise it wouldn’t knock him out all of a sudden. And finally I was wondering who the hell would read the message in those tennis balls, since no one can leave his home. The recurrent fact that’s always used in youth films is again applicable here. The youngsters become true heroes after straightening the crooked, threatening situation and thus save the world from further disaster. Once again the adults are just a gang of morons who aren’t able to solve these problems in a rational and intellectual way. Sean Flynn also happens to have an incomprehensible force. Live with it and don’t try to comprehend it. Also there’s the strange fact that the superior robot (also known as the “Mediator”) can keep an eye on a whole network of robots, but isn’t able to control this individual. I thought this was a bit exaggerated. But it fits in this rather illogical story. Kingsley does not play a memorable role, but he can demonstrate his “wounded self-esteem expression” again. Anderson still looks sensual. There isn’t much more to say about her. Sean (Callan McAuliffe) plays the hero. Enough said. Nathan (James Tarpey) is the irritating member of the group. A windbag who turns out to be a wimp when the going gets tough. And Alex (Ella Hunt) represents the feminine gender and is of no further significance (besides a “Sleeping Beauty” moment at the end). The only amusing acting performance is that of Milo Parker as the little Connor. Brilliant how he can overpower a small group of adults just by using flares. And he’s clever too ! I didn’t know Stannum was Latin for tin. Ultimately, this is a ignorable movie that really aims at a niche segment of the movie audience. It might be a bit too frightening for the really young kids. And a bit too childish for the older kids. And for us adults, it’s completely bland and backward. But are you a “Dr. Who “fan and you’re hooked on old-fashioned-looking lego-blocks-like robots, this adventure film for kids might be able to entertain you. However, this was not for me.